Now that I'm not blogging 5x a week anymore (you're welcome), I'm tweeting in real time a lot more of what would have once become blog content. But that can be a lot of content to keep up with on a daily basis. So, I decided to combine the two to get the best of both worlds. Introducing my new weekly wrap-up post, Spyder Bites. 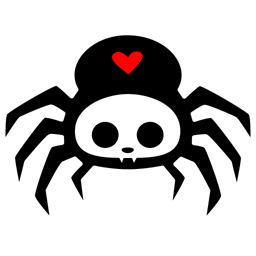 Spyder Bites is a list of mini articles: longer than tweets, shorter than blog posts. The goal is quick snippets of geeky goodness, delivered every Friday. What you can expect in Spyder Bites? The list will be a carefully curated chaotic mishmash of generally nerdy stuff that I come across in a given week. Some might have made it to my Twitter account, some might have gone straight to Spyder Bites. This will be a regular weekly feature, while long-form posts will continue to emerge every couple of weeks. Grab a coffee, scan the list and see what speaks to you. A coffee table book dedicated to showcasing geek art? What goes with your favourite space invaders shirt? Pixelated hair! Seriously this trend is soooo adorkable!! This (almost) makes me wish I still dyed my hair. Then again, I think I'll leave it for the young'uns. Can cyberbullying be thwarted by turning your computer into your conscience? Is our vanity reducing the breadth and quality of content online? If you answered, "Hellzya!" then you're not alone. It seems that everyone's desire for likes, retweets and upvotes is actually impacting our ability to discover knowledge and information. The London School of Economics Impact blog explores the Politics of Circulation in Social Media. Although it focuses on academia, it's applicable to all content discoverability. Speaking of which, are those real-time Tweets in your Google Search results? Do you need a whiteboard on your laptop? You might, if you don't have your Wipebook handy. Curious? Check out the one showcased on ProductHunt. Is Net Neutrality just around the corner? Could be. The FCC will vote soon on whether to make ISPs into utilities. If they do, that decision will hopefully establish net neutrality once and for all (in the US). If you're wondering why this is important, I wrote a very short primer on net neutrality (with a Canadian twist) that may help.